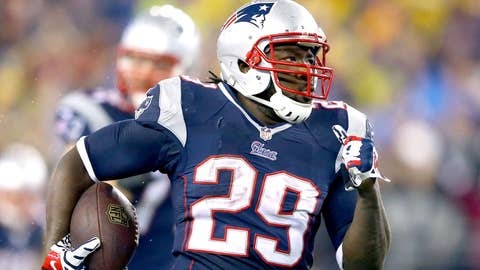 LeGarrette Blount runs for 166 yards and four touchdowns against the Colts. The Patriots made one of the stealthiest offseason acquisitions this past offseason when they dealt running back Jeff Demps and a seventh-round pick to Tampa for LeGarrette Blount. The front-office move paid off in January. The fourth-year running back bludgeoned the Colts defense in the Patriots’ 43-22 win Saturday night at Gillette Stadium. He broke a Patriots team record for touchdowns in a single postseason game. He finished the game with 24 carries, 166 yards and 4 touchdowns. Blount joined Ricky Watters, who had five touchdowns for San Francisco on Jan. 15, 1994, as the only players with four or more in a playoff game. And the six rushing touchdowns by the Patriots tied the 49ers’ total in that game for second most in playoff history. Blount’s big rushing performance came two weeks after he ran for 189 yards and returned two kickoffs for 145 yards in a 34-20 victory over Buffalo in the regular-season finale. Blount, who was best known for throwing a punch during his days at Oregon and went undrafted, has been a pleasant surprise this season.